So, did the key break because she did it with her eyes closed? Or could it be because it wasn't a key at all, and actually just a lolipop. I'm off to finally pick up my copy of Skyrim now! Nice knowing you all. There was just an amazing feeling when we came up with the concept for this page. Looks even better online. ...that is unless you have self control to actually get off that game once in a while, which if the developers did their jobs, you won't be able to. I know... this will be a tough few months. 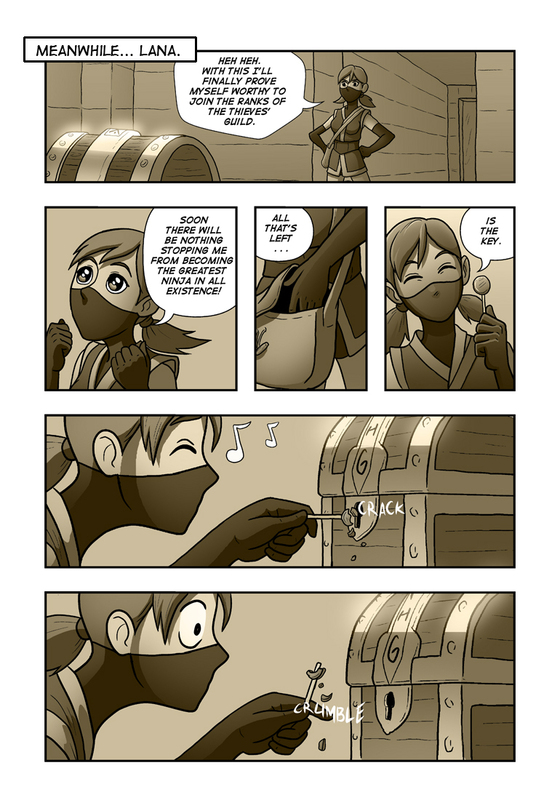 Yeah, that might set her back a bit with joining the thieves guild. Awesome, I thought it was a lollipop before I saw your comment! Has she been duped? Sweet, I was worried about that since it's in black and white. As for her being duped... you're on to something there. :P next page will clear that up. Aha! I look forward to it! Did Low take the real one? Very nice work, looks like she didn't get away with her plans fully after all. Thanks! In this page I did it in actual colors to practice coloring techniques. But for the upload I changed it to the usual sepia. I made a little video actually.